Need orthodontics in Glenpool, OK? CCCD can help! Overbite, gaps, poor bites, crowding. They’re just a few orthodontic issues Complete Cosmetic Care Dentistry in Glenpool, OK fixes for bright, new smiles. Straight teeth look great and stay healthier longer, too. If your child’s smile–or your own–needs the cosmetic and oral health boost braces offer, consult Complete Cosmetic Care Dentistry for the best orthodontics in the Glenpool, OK area. Who wears braces and why? Research estimates that about 4 million people in the United States wear some kind of braces. And, these individuals are not all kids; approximately one-quarter of that number are adults desiring the oral health benefits and self-confidence well-aligned smiles afford. Children should see a qualified dentist, such as Dr. Parnam Mohanna or Dr. Dalia Georgy of Complete Cosmetic Care Dentistry, by age 7. Early evaluation and intervention allows doctors to utilize the fluid tooth movement and jaw development children have in correcting their smiles. This concept is called interceptive care. Typically, children begin wearing braces in the 9 to 14-year-old range, and treatment averages 2 years or so. Drs. Mohanna and Georgy evaluate orthodontic patients with routine oral exams and sophisticated, digital x-rays. Treatment plans may include traditional metal wire and bracket braces and innovative tooth-colored appliances which blend in with the color of tooth enamel. 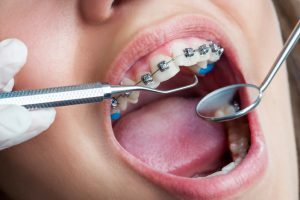 These braces are obvious in appearance, take diligent at-home and in-office hygiene and restrict the wearer in terms of dietary choices. In addition, teeth and gums experience some discomfort as teeth move into more favorable positions, particularly when the dentist adjust the appliances every 4 to 6 weeks. Often, soft oral tissues develop sore spots from irritating brackets and wires. For older teenagers and adult patients with minor to moderate orthodontic cases In Glenpool, OK, Invisalign clear aligners straighten teeth discreetly, without the “metal mouth” appearance of traditional braces. Made from biocompatible, very clear acrylic, Invisalign changes tooth alignment in less time, more comfortably and more quickly–in about a year or so on average. Removable for cleaning and meals, the aligners come in pairs which the patient changes out every 2 weeks or so according to the individualized treatment plan. Are you interested in a healthier you? Then, contact the office staff at Complete Cosmetic Care Dentistry. Arrange an orthodontic consultation for your child or for you, and look forward to the right solution for new smile. Comments Off on Need orthodontics in Glenpool, OK? CCCD can help!